Situated opposite the beautiful ancient Priory Church of St Peter in the heart of Dunstable, this delightful ivy clad hotel stands as it has for several hundred years with an ambience of warm old English charm. The Hotel has a reputation for a very high standard of food and service.The hotel has 68 bedrooms which are a mixture of doubles and twins, designed to standard or executive level, each offering en-suite bathroom and shower, hair dryer, colour television with Sky network, welcome tray with tea and coffee making facilities, ironing board, direct dial telephone and free Wi Fi internet access. 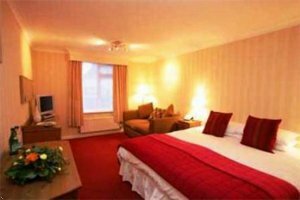 The executive accommodation have extras such as DVD player, dressing gowns and refreshing mineral water. All residents have full use of the R3 leisure gym, which is located 5 to 10 minutes away in Dunstable.